Earlier this week, the Finance Ministry made an announcement that sent Singaporeans islandwide into a flurry – the Goods & Services Tax (GST) will be increased from 7% to 9% sometime between 2021 to 2025. 9% is a whopping amount, and when added with the 10% service charge, amounts to approximately 20% in additional fees when you dine out in Singapore. Whoa. But fret not! Here are some generous restaurants that waive GST so you can get the most bang for your buck. Named after the iconic Rasa Singapura food centre that closed down in 1989, New Rasa Singapura aims to continue its legacy of creating the best Singaporean hawker fare while absorbing both the GST and service charges. Part beloved restaurant, part social enterprise, New Rasa combines the creation of hearty and irresistible local favourites such as beef rendang, with community efforts like providing training and employment to the underprivileged and physically or mentally impaired. Our favourite dishes include their Angoli Fish Head Curry, the Hainanese Chicken Rice and their Dry Laksa. Good food for a good cause? Sign us up! It’s hard to find places in Singapore that actually serves dishes like Red Rice Wine Chicken – a familiar local favourite reminiscent of family reunions and birthdays – but good news! Food For Thought at the National Museum is one such place. Pay them a visit and you’ll find yourself on an elegant trip back in time, with its thoughtfully designed, rustic interior and delicately crafted Southeast Asian fare. Fitting for its location, Food For Thought pays homage to Singapore’s heritage and history through its round marble table tops, wall mosaics, and wooden chairs – evocative of old-school Singaporean kopitiams. Apart from all-day brunch options, their Southeast Asian-inspired menu includes Crispy Curry Chicken and Hainanese Pork Cutlet, and even seasonal specials that reflect particular exhibitions held by the Museum. Inspiration is the name of the game at SPRMRKT. Incorporating a bistro and a concept shop under its roof, this place simply has it all. We recommend you first fill your stomach. Take a gander at their revolving menu which changes depending on the day. Expect fresh eats each day, ranging from Chicken Caesar Salads on some days to Potato, Tuna, and Cucumber with Boiled Eggs the next. If you enjoyed your meal, you can even pick up their in-store groceries to recreate the dishes yourself! The younger sibling of Ninja Bowl on Duxton, Ninja Cut follows in its big brother’s footsteps and creates hearty Japanese cuisine with an emphasis on healthy living. Chow down on favourites such as the Oceans of Mentaiko, where stunning flavours are unveiled, stemming from the harmonious mix of crisp toast, juicy prawns, Hokkaido scallops, and New Zealand mussels, all topped with a mouthwatering helping of mentaiko butter cream sauce. A definite go-to place for a delicious yet healthy meal! Famed for its breakfast-themed options, brunch lovers should already be well acquainted with Lola’s Cafe – a cosy joint located along the charming Simon’s Road at Kovan. There is a bona fide community spirit at Lola’s that can be felt the instant you walk through their doors, a bonhomie that is echoed in their delicious, no-frills, and lovingly made brunch fare. Note: Never leave Lola’s without sampling their Honey Paprika Wings! Looks can be deceiving, and it’s even more so for Stateland. Housed inside a nondescript shophouse within the hip enclave of Kampong Glam, its interior features an industrial theme, complete with cement walls, wooden tables, and tungsten lamps. On top of its sleek decor, it serves up bowl after bowl of experimental dishes given an Asian twist, taking inspiration from cafe classics and local favourites. Be sure to sample their innovative waffles and thick toasts, and also unique dishes like the Hainanese Chicken Rice Risotto and BBQ Sambal Unagi Bowl! *Bonus: places we love that waive service charge instead of GST! Here are a couple of deserving gems we love that absorb the 10% service charge, instead of GST! The service charge waiver at Wheeler’s Yard isn’t the only thing we love about this quaint little joint. We’re sure many of you have seen its famed blue doors on Instagram or Facebook, and are familiar with its industrial-style interior inspired by cycling culture. Be sure to sample their relatively familiar yet strangely exciting menu options, which meld local and international flavours, resulting in dishes like Chilli Crab Pasta, Yuzu Soy Glazed Sweet Potato, and their Ultimate Beef Yard Burger. Featuring a local-inspired menu with items like Shiok Fries, Har Cheong Gai, and even Salted Egg burgers and wings, there’s not much here to dislike. Quaint and cosy with homey wooden floors and furniture, this tucked-away spot conjures up nostalgic memories that are reminiscent of a school classroom. 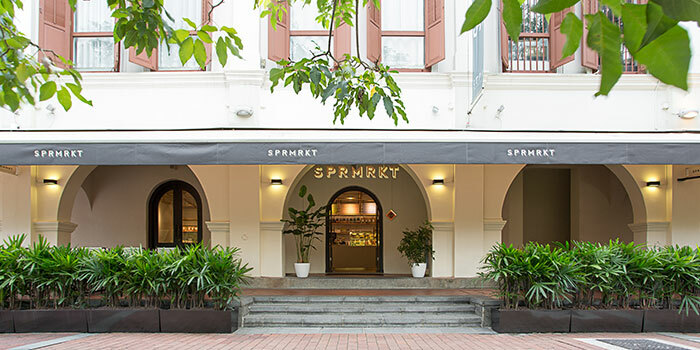 Located in the heart of Tanjong Pagar, it also offers piping hot and aromatic coffee. Even with the GST surcharge, it’s definitely worth a visit!